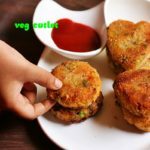 Veg cutlet recipe with step by step photos. Easy to make simple, delicious veg cutlet to be served as evening snack with green chutney. Steam or boil the vegetables until done. Mash well. Do not make it pasty. To the mashed add salt and spice powders. Mix well. Add two tablespoons bread crumbs. Mix well and try shaping a cutlet. If the mixture is loose add one more tablespoon of bread crumbs. Divide the mixture in eight parts. Shape the vegetable cutlet mixture into round or heart shaped using cookie cutter. Mix corn flour or gram flour with water into a thin paste. Dip the shaped cutlets one by one and roll over bread crumbs. Heat oil for shallow frying. Place the cutlets and fry until golden brown from all sides. Drain in a kitchen towel and serve veg cutlet hot.